Best-in-Class Endurance with SLC NAND With quality SLC NAND flash, the CF 1100X promises up to 100,000 erase/ write cycles for a longer lifespan and outstanding endurance, 33 times more durable than MLC based CF cards. Remarkable Performance for Professionals and Enthusiasts The CF 1100X leverages UDMA 7 technology to deliver blazing-fast transfer speeds up to Read/Write 165/151 MB/s, saving time with dramatically accelerated workflow. You can shoot high-quality images and 1080p full-HD, 3D, and 4K video; It also supports shooting 14 fps in JPEG images with full-frame camera, totally releasing the potential of high-end compact cameras. Capturing Cinema-grade Videos The card supports the Video Performance Guarantee (VPG-65) specification. 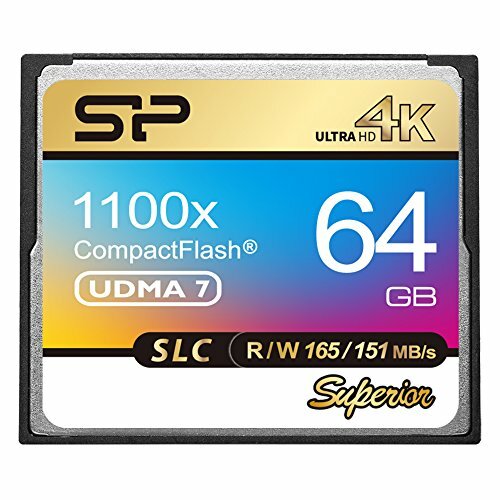 This card has been tested to strictly standards and guaranteed for professional video capture streams at a minimum sustained write speed of 65MB/s for 4K and Full HD video recording. Leading Quality and Lifetime Warranty This card is certified by BSMI, FCC, CE, WEEE, and Green Dot and compliant with European RoHS. Every memory card sold is 100% tested before shipping and backed by lifetime warranty. Meets VPG-65 standard, ensuring a minimum write speed of 65MB/s for video recording.